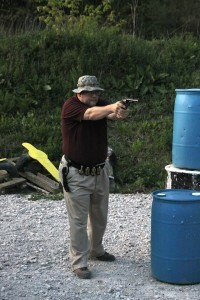 The IPSC group practices on Thursday nights from 1730 – 2000. Practice is open to club members and nonmembers alike. 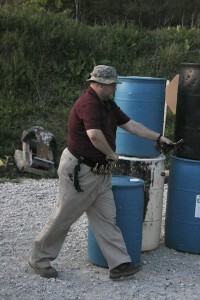 New shooters are strongly encouraged to attend a few practice sessions to learn the range commands and become familiar with procedures before attending an USPSA match. Practice last night was fun! Roy and Rob set up a stage with 11 paper targets staggered behind barrels and a single popper. Being able to see multiple targets from multiple positions makes a solid plan a necessity as many discovered. Luckily there was a vantage point behind the 180 that was near perfect for capturing some pictures as shooters turned to engage a target about 15 feet directly ahead. The full size pictures are 3.4 MB each so they have been condensed here for easy loading. If you would like a full size picture please ask and arrangements will be made for delivery.